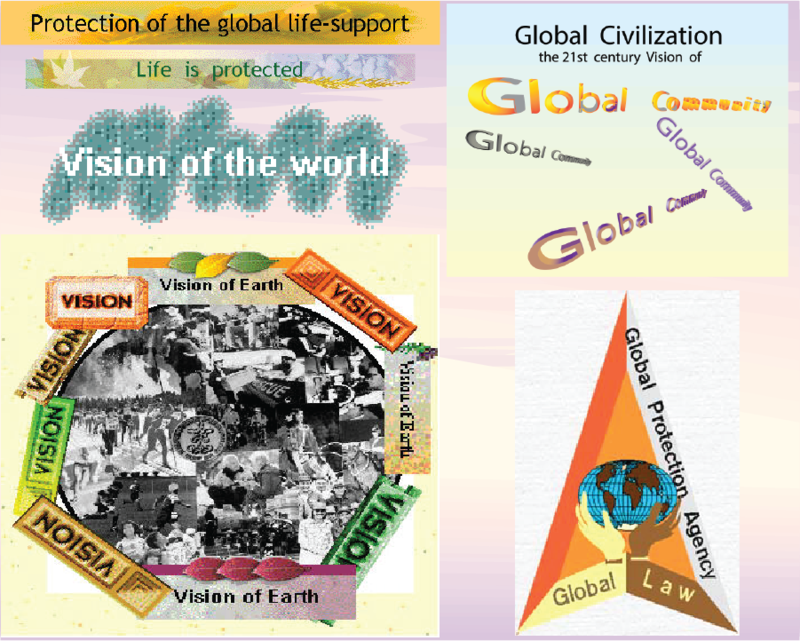 Protection of the global life-support systems. As a first step to getting help in managing those threats to security, all nations can and should approve the first three sections on the Scale of Global Rights . The approval would supersede a nation political and physical border anywhere in the world. The Global Protection Agency (GPA) would have the approval from all member nations to give immediate help. Somewhat like an emergency unit but at the global level. That is what those first three sections mean: an efficient and immediate emergency response to help. First, participating member nations need to give their approval to the GPA. The GPA is a short term solution, an immediate response to help. There are also long term solutions. As with the short term solution, the most significant long term solution is also related to the Scale of Global Rights. Is this a sustainable system? We need to recognize the failure of fundamental systems and to abandon the notion that all there is to do is recalibrate the institutions that structure our lives today. Somewhat like the US Congress is doing. Print dollar bills by the trillions, inject them into the system, and everything will be fine. We need to realize that the way we thought things would work out truly is gone. Capitalism is at the core of this unsustainable system. It gives rise to the high-energy/mass-consumption configuration of privileged societies. We must set-up measures to stop speculators from benefiting from the misery of others, by punishing corrupt politicians, and by collectively understanding that bankers are rich because we have placed our money in their hands. Ultimately, unless we begin to see the world as a whole, in which things are truly interconnected, our governments will continue their hostilities, and when the time comes for us to complain, we will be faced with the guns of the police whom we have helped to create with the payment of our taxes. It's time for us to come to terms with reality. We need ways of organizing ourselves to help us live in a world with less energy and fewer material goods. We need to recover a deep sense of community that has disappeared from many of our lives. The World is in the global crisis. We are exploiting our natural resources, minerals and fuels faster than we are gaining access to alternative sources. We are polluting the natural environment faster than the environment can regenerate itself to reach the level suitable for human needs. We are changing climate dangerously. Our attitude and way of life show a moral degradation of the existing forms of life on the planet. It's time for us to protect what is left to protect: life itself on Earth. This is the reason for the creation of a planetary biodiversity zone. In this paper we have shown the benefits of biodiversity to humanity and hope this approach will motivate others to help create the zone. Climate change is a result of the rising global temperatures associated with global warming, the effects of which have a direct impact on all life on Earth. Global warming due to human activities is contributing to the melting of the polar ice caps. The Polar Regions are very sensitive indicators of global warming. These regions are highly vulnerable to rising temperatures and may be virtually ice free by the summer of 2030. Satellite and other monitoring confirm that the Arctic sea ice has been declining in both thickness and size. A significant reduction last summer indicates that the summer ice may disappear much sooner than expected. Obviously something has to be done! We propose a tight global policy, benignly implemented, or it will be very nasty indeed. In practice, a human population of 10 to 12 billion would be too uncomfortably high and would add a high strain on world resources. What kind of world population would be reasonable? What goal should we aim at? A population should be small enough to be sustainable indefinitely and still allow plenty of leeway for ourselves and other lifeforms. It should also be large enough to allow the formation of healthy civilizations. 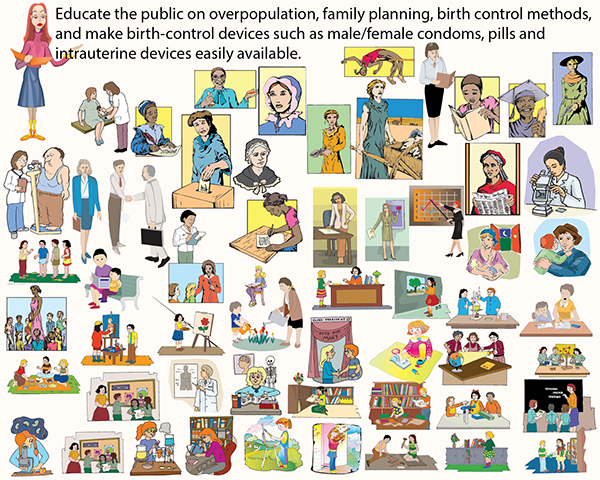 Comprehensive population policies are an essential element in a world development strategy that combines access to reproductive health services, education and economic opportunities, improved energy and natural resource technologies, and to healthier models of consumption and the 'good life'. 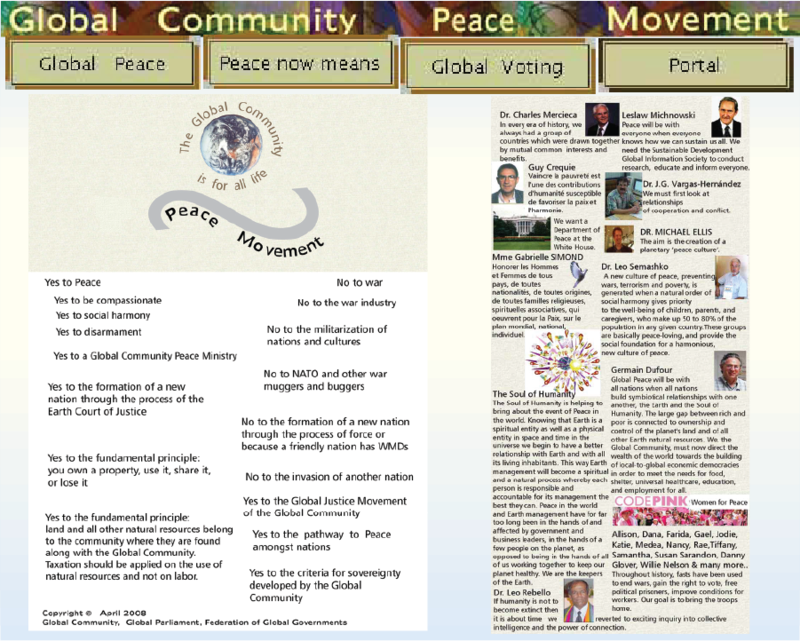 Would you agree to the promotion of the world development strategy proposed by Global Community ? The variety of ecosystem types include forests, grasslands, deserts, wetlands, streams, lakes and oceans, and the global communities within them. These communities interact with each other and with the non-living environment. It is well known that the planet's diversity is being threatened. The effect that human activities have had on our planet have become a major concern. Erosion, pollution, desertification, increased rates of extinction can all be traced back to human activities and are now starting to completely change the future of life on the planet. Development in society affects dangerously biodiversity. Perhaps we should understand better the good of biodiversity. At the ecosystem level, as shown on the folowing table, biodiversity provides numerous benefits and services to Global Community. Global Community has also established a planetary biodiversity zone now under the protection of the Global Protection Agency (GPA). We have declared a moratorium on all development in the zone. The more detailed planetary biodiversity zone in the North Pole region was declared a few years ago to prevent further drilling and development until proper regulations and protection have been established. This would prevent the kind of catastrophic event that occurred in the Gulf of Mexico. The people of all nations are required to respect the moratorium until global law has been completed to include regulations to be enforced by the GPA. Global Community believes that to protect this ecosystem, industrial activity both inside and outside the planetary biodiversity zone must be carefully regulated. Large reserves able to maintain their ecological integrity must be adequately set aside and thorough environmental assessments must be carried out before governments decide to allow any sort of large-scale industrial activity. Global Community has declared a moratorium on all development in the zone, including all drilling, military testing, and any other destructive uses of the ecosystems. A primary cause of ecosystem destruction and species extinctions is the human overpopulation that already far exceeds ecologically sustainable levels. Total world population, now at 6.7 billion, is inexorably climbing by 75 million a year. Every additional human is an environmental “user” on a planet whose capacity to provide for all its creatures is size-limited. In all lands the pressure of numbers continues to undermine the integrity and generative functioning of terrestrial, fresh water, and marine ecosystems. Our human monoculture is overwhelming and destroying Nature’s polycultures. Country by country, world population size must be reduced by reducing conceptions. Educate our childrenn on the ethics that value life species over consuming resources without restraint, and condemn the social acceptance of unlimited human fecundity. Present need to reduce numbers is greatest in wealthy countries where per capita use of energy and Earth materials is highest. A reasonable objective is the reduction to population levels as they were before the widespread use of fossil fuels; that is, to one billion or less. This will be accomplished either by intelligent policies or inevitably by plague, famine, and warfare. The greatest threat to the planetary biodiversity zone is the ever-increasing appropriation of the planet’s goods for exclusive human uses. Such appropriation and over-use, often justified by population overgrowth, steals the livelihood of other organisms. The selfish view that humans have the right to all ecosystem components – air, land, water, organisms – is morally reprehensible. It is wrong. Global Rights were researched and developed for all life on our planet, not just for ourselves as human beings. Unlike plants, we must kill to feed, clothe and shelter ourselves, but this is no license to plunder and exterminate. 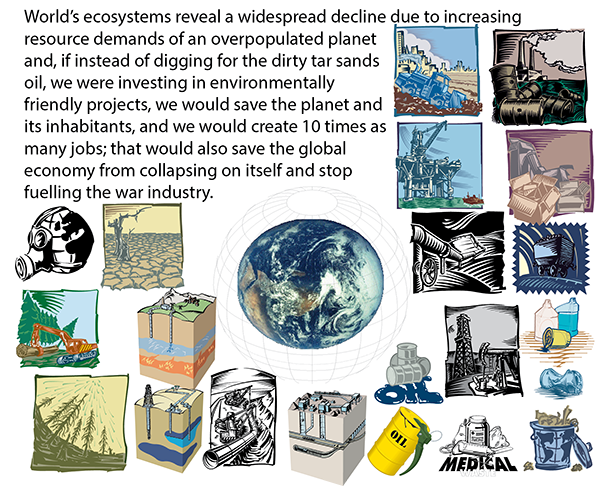 The accelerating consumption of Earth’s vital parts is a recipe for destruction of ecodiversity and biodiversity. Wealthy nations armed with powerful technology are the chief offenders, best able to reduce consumption and share with those whose living standards are lowest, but no nation is blameless. The eternal growth ideology of the market, and Wall Street, must be renounced, as well as the perverse industrial and economic policies based on it. One rational step toward curbing exploitive economic expansion is the ending of public subsidies to those industries that pollute air, land or water and/or destroy organisms and soils. A philosophy of symbiosis, of living compliantly as a member of Earth’s communities, will ensure the restoration of productive ecosystems. Concepts of governance that encourage over-exploitation and destruction of Earth’s ecosystems must be replaced by those beneficial to the survival and integrity of Global Community. Everyone is asked to help. A body of environmental law and regulations that confers legal standing on Global Community’s vital structures and functions is required. Country by country, ecologically responsible people must be elected or appointed to governing bodies. Appropriate attorney-guardians will act as defendants when ecosystems and their fundamental processes are threatened. Issues will be settled on the basis of preserving ecosystem integrity, not on preserving economic gain. 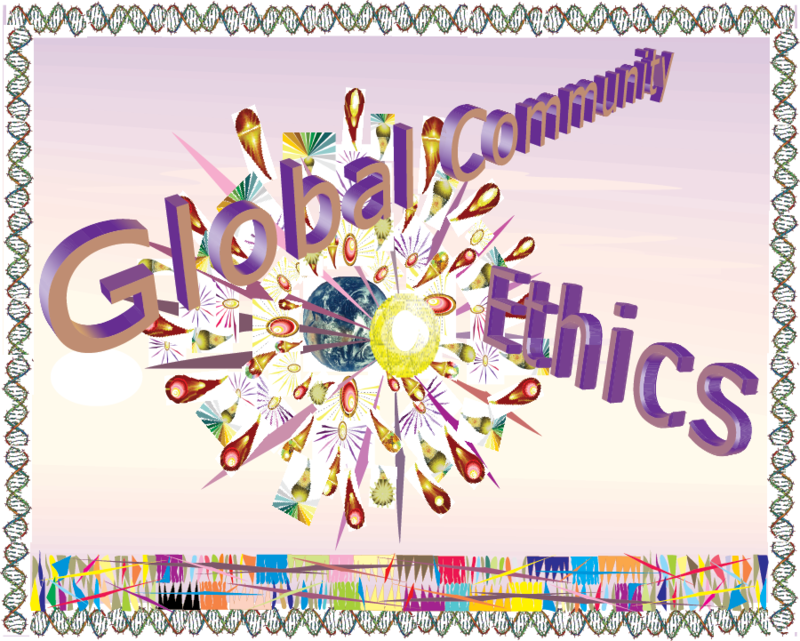 Over time, new bodies of global law, policy, and administration will emerge as embodiments of the 21st Century life philosophy of Global Community. Implementation will be the work of the Global protection Agency (GPA). We all have a duty to spread the word by education and leadership. The initial urgent task is to awaken all people to their functional dependence on Earth’s ecosystems, as well as to their bonds with other species. We must all participate in Earth-wise global community activities, each playing a personal part in sustaining the marvelous surrounding reality. By promoting a quest for abiding values – a culture of compliance and symbiosis with our living planet – it fosters a unifying outlook. By spreading the ecological message and emphasizing humanity’s shared outer reality, will open a new and promising path toward international understanding, harmony, cooperation, stability, and peace. In order to better protect life on our planet, Global Community is asking people of all nations to defend and protect their natural resources. In particular, all the hydrocarbons within a national territory must be nationalized. It is an obligation, not only of a national government, but also of all the active forces in a country; it is the duty of local and municipal authorities, the duty of state authorities, of everyone, to take upon themselves this defense and this recuperation of natural resources. Nationalization is a necessity because American corporations have been buying local corporations to acquire natural resources of a country. This state of affairs has been going on ever since WWII. Over the past decades, the US national debt and annual deficit have been out-of-control because of a complete business freedom of the US corporate world. No taxation! When a large corporation is about to go out of business, the White House intervened with a bail out. This bail out money is really fake money coming out of nowhere. It was never "earned" money. The USA Government prints out dollar bills by the trillions and gives them to American corporations and banks so they can buy corporations, properties, resources and land of other nations all over the world. They call that economic warfare and free trade. The Global Protection Agency provides leadership for training of other countries' citizens who would like to participate in peacekeeping and Earth security ... so that we have a ready cadre of people and nations who are trained, equipped, organised and have communications that they can work with each other. 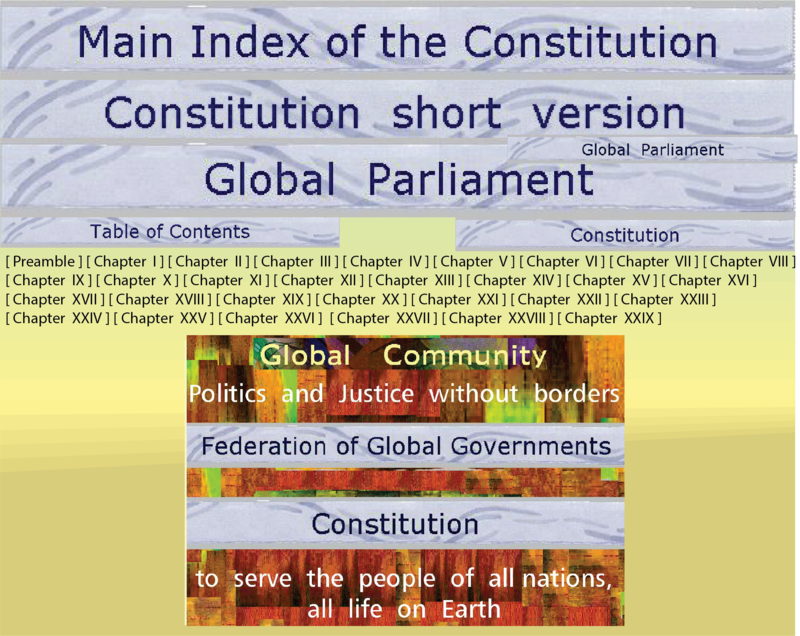 God Law, Ecclesiastical Teaching, Civic Law by Government, Natural Processes and Laws, are fundamental pillars of Global Law. The work of Global Community, the global civil society, and the determination of government worldwide, make it possible for everyone to comply with the law. 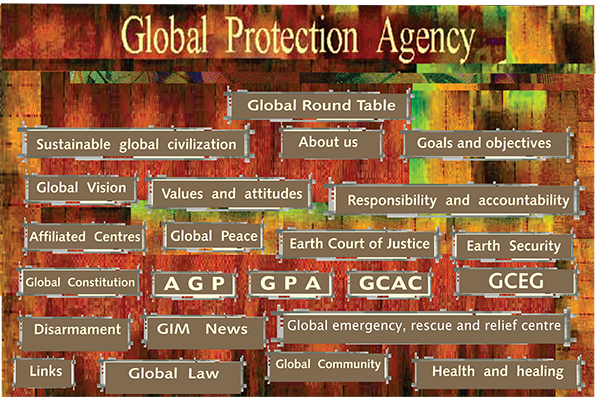 The Global Protection Agency (GPA) enforces the law. 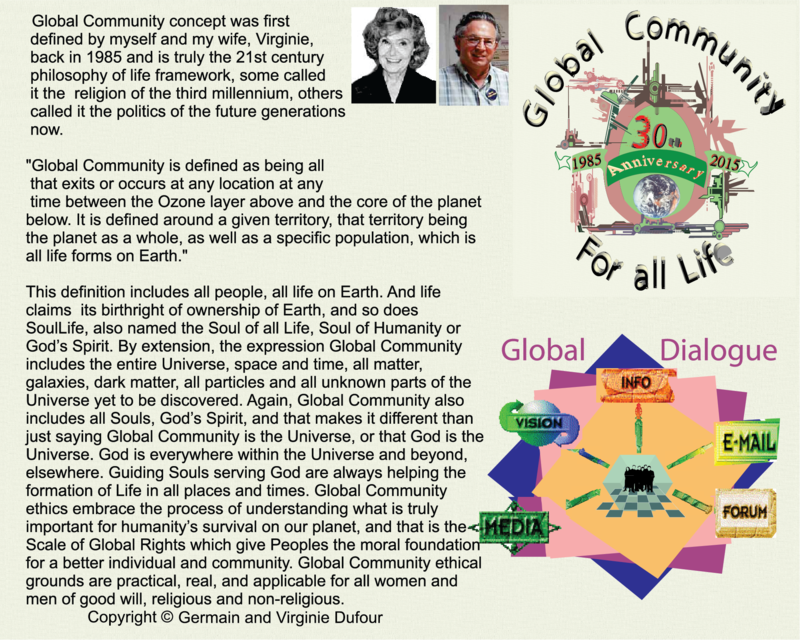 Building global communities requires a mean to enforce Global Law for the protection of life on Earth. 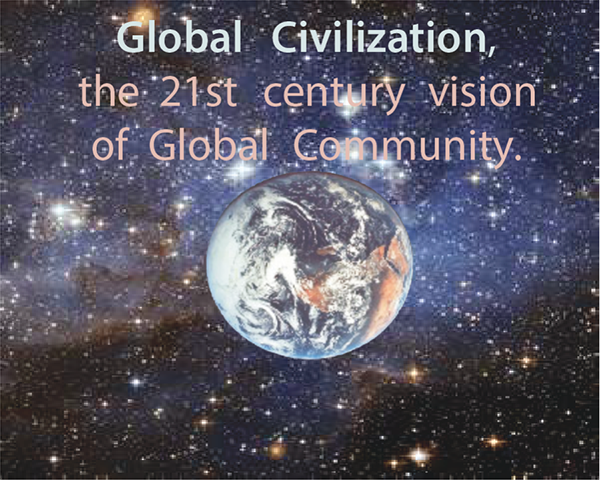 Global Civilization guides humanity for the building of global communities. 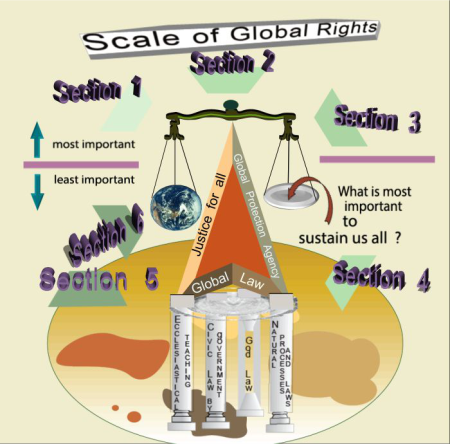 Global Law includes legislation covering all aspects of human activities. 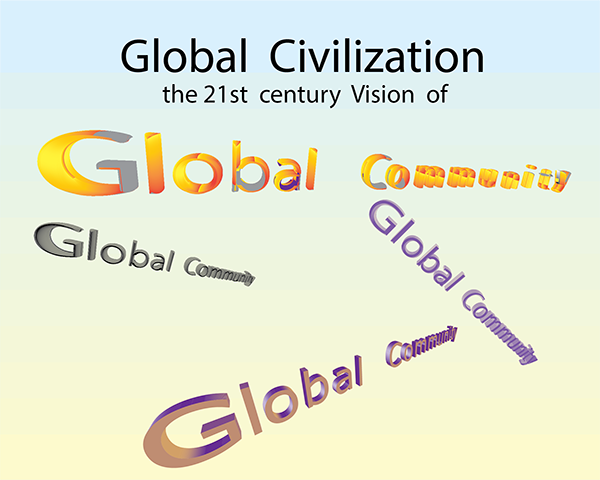 As we enact global law, we will begin to take on a much deeper kind of global leadership, one that earns more respect than envy and more gratitude than hatred, one that can catapult the whole planet forward into a future where war is no longer thinkable between nation-states and a legitimate and beneficial global government is able to cope with global problems. Global Community has made clear that globalization and planetary trading blocks should be serving the Human Family and not the other way around, the people around the world serving the very few rich individuals. Conflicts and wars in the world are often the results of bad trading of arms and oil and the absence of moral responsibility and accountability in our ways of doing business with nations such as those of the Middle East. By applying proper moral safeguards, ethics, and accepting responsibility and accountability of all products (arms and oil in this case), from beginning to end where they become wastes, each corporation would make free trade and globalization serving the Human Family. Over its long past history trade has never evolved to require from the trading partners to become legally and morally responsible and accountable for their products from beginning to end. At the end the product becomes a waste and it needs to be properly dispose of. Now trade must be given a new impetus to be in line with the global concepts of Global Community. When you do exploration work, develop, manufacture, produce, mine, farm or create a product, you become legally and morally responsible and accountable of your product from beginning to end (to the point where it actually becomes a waste; you are also responsible for the proper disposable of the waste). This product may be anything and everything from oil & gas, weapons, war products, construction products, transportation and communications products and equipment, to genetically engineered food products. All consumer products! All medical products! All pharmaceutical products! In order words, a person (a person may be an individual, a community, a government, a business, an NGO, or an institution) becomes responsible and accountable for anything and everything in his or her Life. To act as a global policing force, as the GPA aspires to do, many foundations must be laid, especially regarding the move from wielding power derived from Global Community to legitimate global leadership. The defence function of a leader requires that he safeguard the good of the whole by whatever the most skillful means are to accomplish that defence. While that is not a comprehensive catalog of leadership prerequisites, I do think those few requirements are foundational and relatively unquestionable. Without at least a solid foundation of those requirements, the GPA’s actions among nation-states will remain those of a unilateralist leader rather than a global leader. We will be, and should be, legitimated in the role of a global leader among nation-states and validated as an enforcer of global law. Global Community offers a few recommendations for actions that would strengthen and legitimate the GPA’s role as a true global leader by gradually creating an international structure that better safeguards the whole than we can ever do now as a unilateralist leader. Our world is facing crises of freshwater, food, deforestation, ocean health, and destruction of the global life-support systems. We need leadership in the protection of all our natural resources, in peril because of what we do and what that does to our planet. We are facing a fresh water crisis. We are facing a food crisis. We are facing a crisis over deforestation. And we are facing crises in our oceans. While carbon emissions from fossil fuels pollute the air, land and our oceans, we are facing the climate change crisis. Now is the time to press for leadership. Those who fight to protect life on Earth for this generation and the next ones are the defenders of the environment and the global life-support systems. They know who the beasts are, the planarchists , and how they destroy the living on our planet. They have rallied together all over the world to protect our home, Earth. We know it all! We know how everything works. And we will do whatever it takes to protect life on Earth. Global Community believes that to protect the Earth ecosystems, industrial activity both inside and outside the planetary biodiversity zone must be carefully regulated. Large reserves able to maintain their ecological integrity must be adequately set aside and thorough environmental assessments must be carried out before governments decide to allow any sort of large-scale industrial activity. Actions that affect the stability and health of Global Community and its ecosystems need to be identified and publicly condemned. Among the most destructive of human activities are militarism and its gross expenditures, the mining of toxic materials, the manufacture of biological poisons in all forms, industrial farming, industrial fishing, and industrial forestry. Destructive technologies such as these, justified as necessary for protecting specific human populations, enriching special corporate interests, and satisfying human wants rather than needs, will lead to evergreater ecological and social disasters. It is time for global citizens to come to terms with reality. We need ways of organizing ourselves to help us live in a world with less energy and fewer material goods. We need to recover a deep sense of community that has disappeared from many of our lives. The World is in the global crisis. We are exploiting our natural resources, minerals and fuels faster than we are gaining access to alternative sources. We are polluting the natural environment faster than the environment can regenerate itself to reach the level suitable for human needs. We are changing climate dangerously. 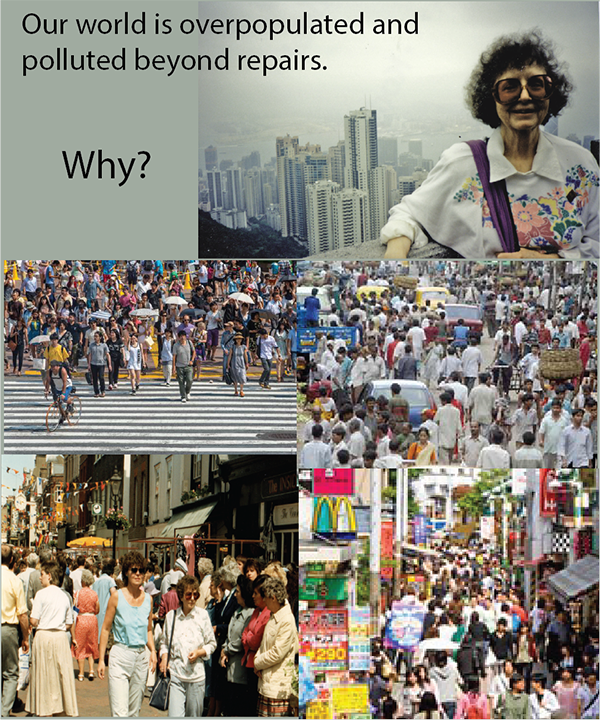 Our attitude and way of life show a moral degradation of the existing forms of life on the planet. It's time for us to protect what is left to protect: life itself on Earth. 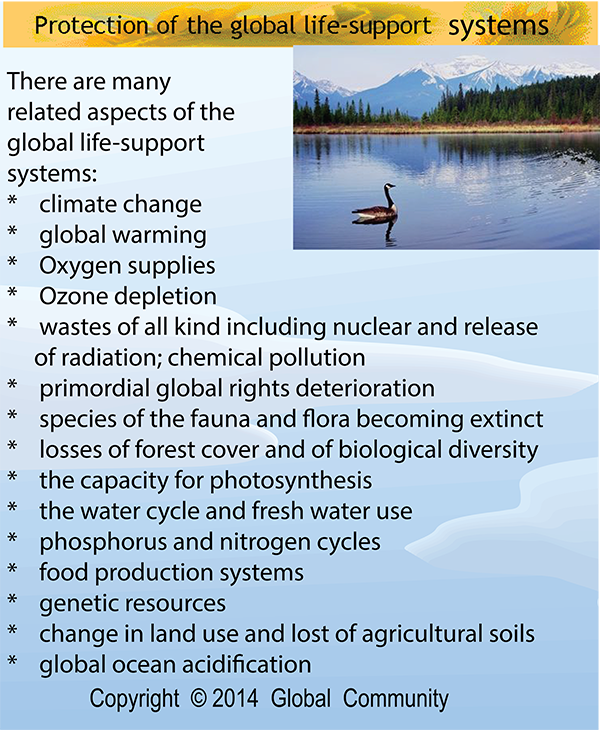 This is the reason for the creation of a planetary biodiversity zone. In this report we have shown the benefits of biodiversity to humanity and hope this approach will motivate others to help create the zone. In the past, security was thought as better accomplished through military means. Expanding the military capabilities and forming alliances with other nations were the only way to 'win'. Today wars are unlikely to produce winners. Global Community is all over the planet. Ethnic groups are everywhere. Some say there are more Italians in Montreal, Canada that there are in Italy. So we would fight our own people? Wars truly make no sense! The world is too crowded and too small nowadays! And weapons too lethal! So security cannot be achieved through the military. The only job the military should be asked to do today is to protect the global life-support systems. 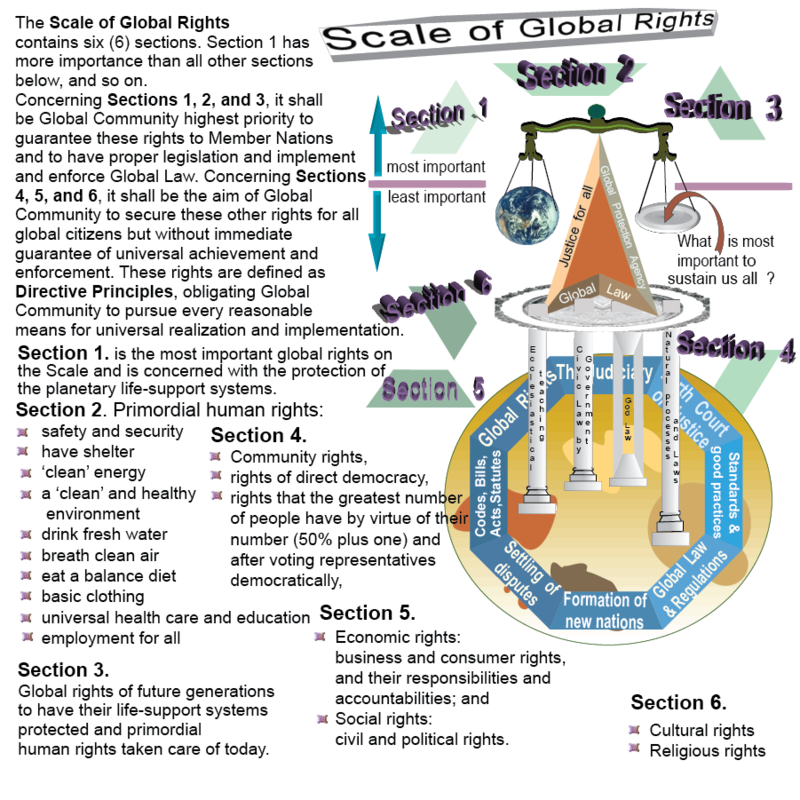 These systems have the highest priority on the Scale of global Rights and are certainly more important than any of the other rights on the Scale including security. Simply because without life there is no other right possible. Without Oxygen there is no life! Without clean water there is no life! So protect life on Earth at all costs. Wars are the biggest threat to life and the ecosystem of the planet. Primordial human rights come next on the Scale of Gobal Rights. Without a shelter life will still exist in some places but is not possible in cold place. In this Century, the affairs of humanity appeared to be unfolding in more profound ways. We can no longer perceive ourselves as a People who could survive alone and a People who does not need anyone else. 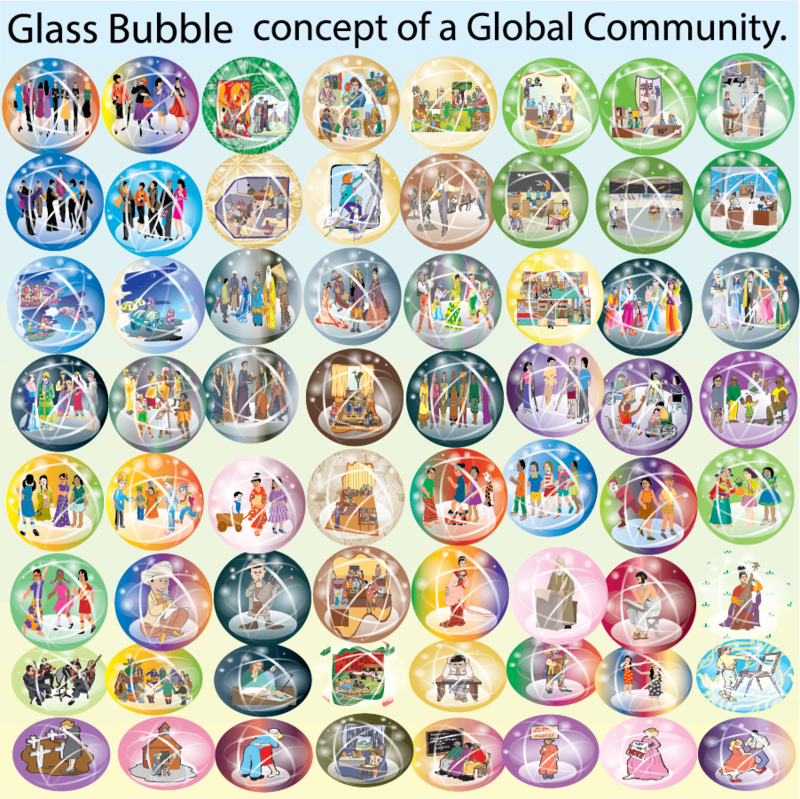 We belong and depend to a much larger group, that of Global Community, the human family. The 21st Century will see limitless links and interrelationships between Global Community and the build up of Global Civilization. New standards, goals and objectives are being defined. Firm universal guidelines are essentials to keep the world healthy. Already we notice new ways of thinking being embraced, new behaviors and attitudes adopted. 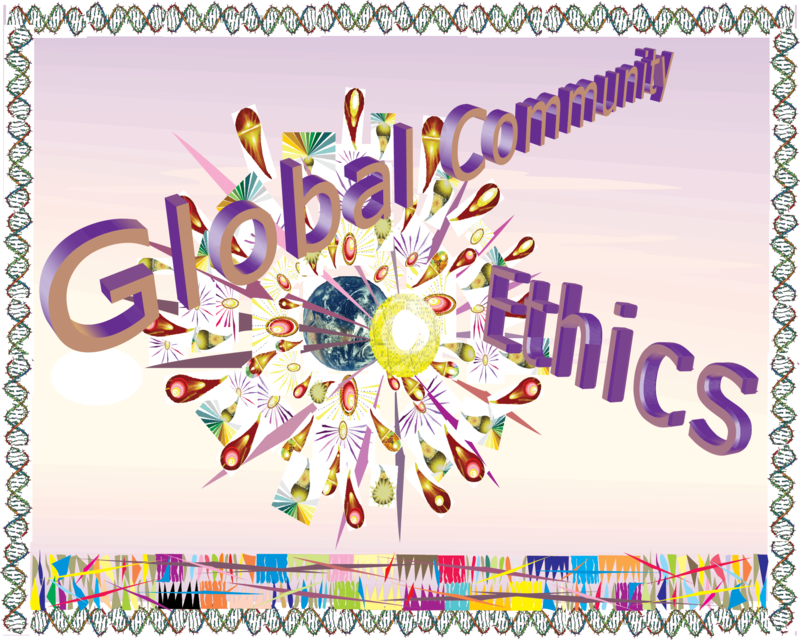 Global ethics are now required to do business and deal with one another to sustain Earth. Let our time this generation be a time remembered for the awakening of a new reverence for life, the firm resolve to achieve sustainability, the quickening of the struggle for justice and peace, and the joyful celebration of life. Let us build up Global Civilization and its Global Parliament. Global Community has been promoting the need for a change in thinking and of doing things amongst all nations. We need to realize what is a priority, what is the most important, and what is the least important for our survival as a species. We need to make hard choices. We need a clear vision. We need a common vision. As never before in history, common destiny amongst all nations beckons us to seek a new beginning. 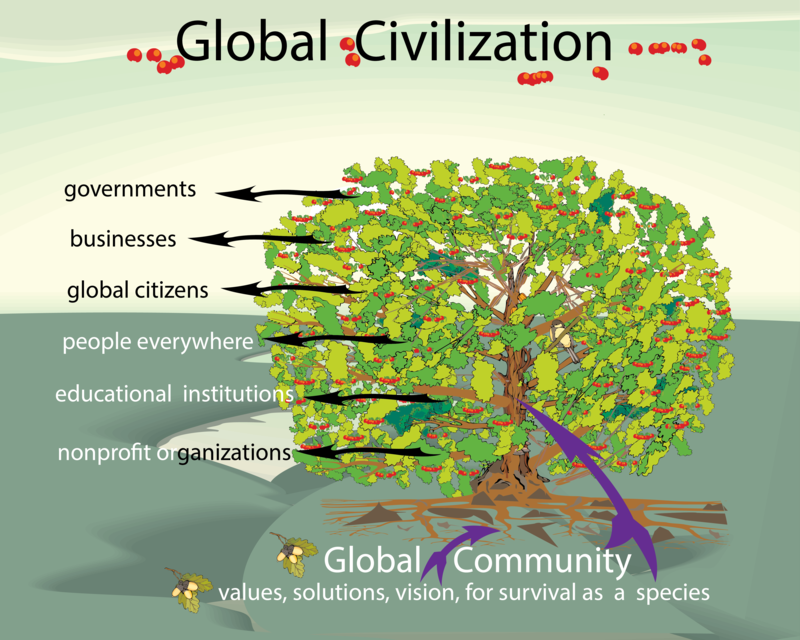 Global Civilization is being built on fundamental principles, a sound science, to propose policies and strategies for the management of global changes. This requires a new sense of global interdependence and universal responsibility. Knowing well the global commons for life survival on our planet, we must develop and apply the vision of a sustainable way of life locally, nationally, regionally, globally, and within ourselves. Our cultural diversity is a precious heritage and different cultures will find their own distinctive ways to realize the vision. Every individual, family, organization, and community has a vital role to play. The arts, sciences, religions, educational institutions, media, businesses, nongovernmental organizations, and governments are all called to offer creative leadership. In this way, the heart, mind and spirit of Global Civilization will be in the forefront of positive actions to ensure our survival. We need to build global communities for all life on the planet. The key is personal responsibility. Therefore the individual is the important element, one who takes responsibility for his or her community and the build up of Global Civilization. This individual cares about jobs, homes, and the community. Amongst the most important issues facing our world today is the controlling of our overpopulated planet. We are asking it to be socially acceptable for women to have the freedom of having or not having children, and to make that socially acceptable. For this to work, women must also be given equal rights to men in every way. Those men and women who choose to raise a family of one or more children will be given support within Global Civilization. The effect of such change in our ways will be acceptance of being a part of Global Civilization, and that each one of us is doing things for the good of all. Can the world become a better place to live in? Of course! Let us launch a global campaign for the restoration and renewal of our planet and ourselves as one humanity, and as Global Civilization. 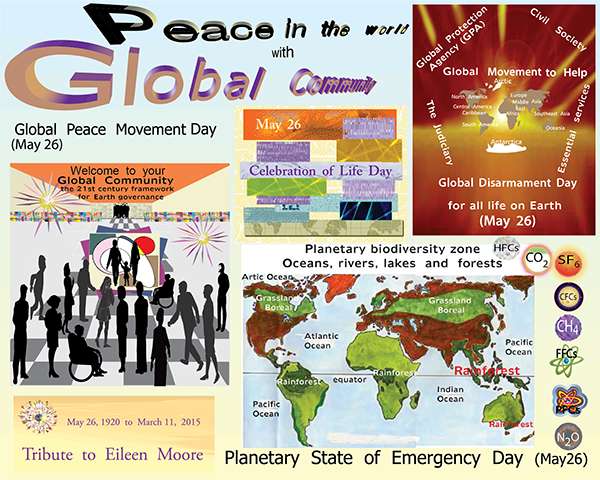 Let us promote the creative actions and the ideas that are healing and nurturing people and planet. Humanity has reached a point in its evolution where it knows its survival is being challenged. Symbiosis has worked throughout the evolution of life on Earth, and today, our time is the age of global cooperation and social symbiotical relationships. We help one another, joint forces, and accomplish together what we cannot accomplish separately. We must develop and apply the vision of a sustainable way of life locally, nationally, regionally, globally, and within ourselves throughout life. Our cultural diversity is a precious heritage and different cultures will find their own distinctive ways to realize the vision. For our survival as Global Community, and as a collective intelligence, we need to learn about ecological dangers we face, their causes, and how to render them harmless. We all have a strong moral obligation to protect and conserve the biodiversity of life on Earth. Local, community-based economies, are crucial for the well-being of our children, and to make global communities a reality. So security must be achieved by other means than wars. We might as well shelved the war industry from humanity right now and that means phasing out all nuclear, biological, chemical weapons right now. No waiting! That also means having inspectors verifying the phasing out in all nations of the world, and not just in some Middle East country. The nature of global security has changed since the rise of the Global Community. Security used to be about the protection of the state and its boundaries, people, institutions and values from an outside threat. Global Community emphasizes as a priority the prohibition of external interference in the internal affairs of sovereign states. Today the security of people within the Global Community is just as important as the security of states. Citizens must be secure. 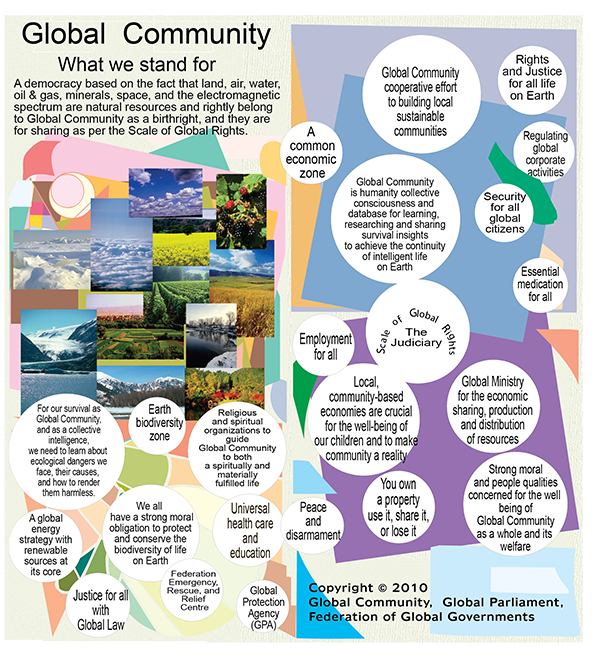 The Global Community is just as important as the security and life of citizens and states. The defence function of a leader requires that he safeguard the good of the whole by whatever the most skillful means are to accomplish that defence.